Janis Elaine (Lund) Emry, 89, of Fremont, NE passed to her eternal home on April 2, 2018. Janis was born on August 11, 1928 to Jay and Grace (Soden) Lund in Dixon County, NE. She spent her childhood on a farm near Allen, NE. She met Milton Emry at Allen High School and they were married on May 3, 1947 at First Lutheran Church. In May of last year, Janis and Milton celebrated 70 years of marriage. Janis was a teacher in a one-room schoolhouse before becoming a mother to six children. In 1960, Janis and Milton moved to Fremont. Later, she worked for Fremont Public Schools as a paraprofessional working with special needs children. 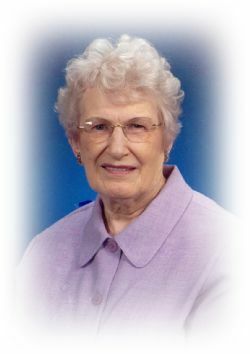 She was a long-time member of Salem Lutheran Church, where she served for many years. Survivors include: husband of 70 years, Milton Emry; four sons: David (Gay) of Omaha; Ken (Shelley) of Monument, CO; Randy of Lincoln; and Mark of Sioux Falls, SD; two daughters: Karla (Mark)Backhuus of Bennington, and Leisa (Mitch) Larson of Lincoln; eleven grandchildren: Darci (Michael) Davis, Jason (Juli) Emry, Shannon Hoime, Kayci (Megan McNeal) Emry, Guy (fiancé, Katharina Lierow) Emry, Tim Emry, Joel Schuett, Emma Larson, Sam (Sydney) Larson, Grace Larson, and Nora (fiancé, Jared Wentzlaff) Larson; two brothers: Duane (Barb) Lund of Allen, Doug (Betty) Lund (of Kearney); nine great grandchildren, and numerous nieces, nephews, and cousins. Janis was preceded in death by her parents, Grace and Jay, and daughter-in-law, Mary Beth Emry. The funeral service will be Friday, April 13 at 11 AM at Salem Lutheran Church (401 E. Military Avenue, Fremont). Visitation with the family will be 6 to 8 PM, Thursday, April 12 at the Ludvigsen Mortuary Chapel in Fremont. Memorials can be directed to the family.